Continuing the success of the bestselling Practice Makes Perfect series, Practice Makes Perfect: Intermediate English Grammar for ESL Learners embraces all aspects of English grammar that you need to advance your English-language skills. 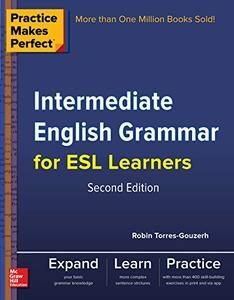 This practical, insightful book helps you in understanding how and why certain grammar elements are used. With help from this book, you will move beyond the basics and master the subtleties that come naturally to native speakers. This second edition provides you with invaluable digital tools to ensure mastery of the content.